This article has been written for CIE A Level Art students who are working on their A2 Art Personal Study. It focuses purely on how to write the text of the Study; a previous article outlines how to come up with a good topic; a future article will address the illustrations and presentation methods. The Personal Study is an area of uncertainty for many A Level Art students. It differs from projects that are usually completed within high school Art programmes, as it involves a substantial written component (maximum 3,500 words) – something which can intimidate students, especially if they are unfamiliar with how to critically analyse an artwork, make informed judgements and write personal evaluations. With few examples of quality Personal Studies available, it can be difficult to know what is expected and how to begin. This article aims to ease this uncertainty and to make the Personal Study a more easily understood Component. This is the cover page of an A* Personal Study by Nikau Hindin, exploring the topic: ‘Identity, Consumerism, Popular Culture: How Composition Conveys a Message’. The project analyses artwork by New Zealand artist Kelsy Taratoa. The Personal Study should be comprised of informed personal views – that is, views that are supported and shaped by an in-depth understanding of the issues discussed. Before starting the project, students should conduct thorough background research, selecting and recording information from second-hand sources (such as books, websites and other publications) and first-hand sources (interviews with artists, studio visits / gallery visits etc). Interviews with artists should be planned thoroughly, after preliminary second-hand research has been completed (as findings from research will suggest important issues to discuss with the artist). Please talk me through the process you follow when designing your paintings. Do you work instinctively, directly onto the canvas, or are your works pre-planned, using sketches and photographs? What influences your choice of colour? I am interested particularly in the colours used in [insert name of painting/s]. Could you explain your thought process behind the use of colour in this work, particularly the [give example]? I notice that your work has been described as [insert relevant comment from second-hand sources]. Do you agree with this statement? How do you respond to this? I notice that [insert an aesthetic feature of their artwork i.e. ‘angular line’ or ‘organic form’] is a dominant feature of your work. Is this strongly connected to the ideas that you are exploring? Have you used these elements deliberately? Can you show me work in progress or semi-complete artwork? I would love to understand the process you go through and how you apply media at different stages. Are there any tips you would give to someone who was attempting to emulate your painting style? Which artists have influenced your work? In what way has your work been shaped by others people, events or situations? Conducting research is critical for creating an excellent Personal Study, however, it should be noted that submitting research on its own will not gain a student any marks. Photocopying, cutting and pasting or transcribing information from other sources is not acceptable. Examiners do not want to read long lists of facts or chronological sequences of events. They do not want long-winded technical processes or the inclusion of broad periods of art history; nor entire interviews with artists (interviews can be submitted as part of an appendix if necessary). Students should not include an extensive artist biography (only brief and relevant details are needed) nor include vast passages of text that have been regurgitated from other sources. Instead, students must select the information which is relevant and analyse this in detail, evaluating and interpreting findings in relation to the focus of their study. Research should be used to help form intelligent, knowledgeable, personal responses: to explain, justify or support the viewpoints, judgements and conclusions that are presented. Evidence of research might be demonstrated, for example, through the use of carefully chosen quotes (to support or contrast the student’s own ideas) or through the inclusion of correct terminology and background knowledge to communicate an in-depth understanding of relevant issues. Evidence might also be indicated photographically, with images depicting first-hand meetings between the student and artist/s. This Personal Study by CIE A2 Level Art and Design student Alice Ham, from ACG Parnell College, shows a cleverly selected quote alongside images by New Zealand charcoal artist Liam Gerrard. Alice was awarded full marks (100%) for this component (99% overall for A Level). Introduction. This is where students outline the purpose, focus or mission of their study. This may include question/s they are going to answer; themes they are going to explore; issues they hope to address etc. It should set the scene for the project and may include reasons for selecting a topic and an indication of how / why the topic is of personal relevance or interest to the student. It is important that the intentions of the project are clearly set out in this section, so that the remainder of the project can be structured accordingly. Body. This is the main part of the Personal Study and will need careful thought. It is usually organised into separate sections (which may be formal chapters, or simply different areas of a visual study), usually with individual headings and sometimes sub-headings. (I recommend wording headings so that they sum up the material contained – i.e. ‘Analysis of Composition: [artwork title]’ rather than ‘Chapter 3’. This means that the examiner is able to see immediately that the student has covered a range of appropriate areas). The sections should be ordered logically and address the focus of the project; they should NOT ramble haphazardly from one issue to the next. High school Art students have a tendency to write without any preconceived order or structure, discussing issues spontaneously as they think of them. While this can be a suitable approach for more creative writing tasks – and can pulled off by certain students – this strategy runs the risk of creating a muddled and incoherent Personal Study. Conclusion. This is where students summarise key points from the project, arrive at final conclusions and make considered personal judgements about what has been learnt. Taratoa’s use of composition helps convey his message concerning identity construction. The arrangement of elements is symbolic of an unconscious hierarchy within his paintings that forces the viewer to question and analyse them. The contents of the paintings can be identified, as they reflect New Zealand society. Taratoa’s use of colour is vibrant and modern, echoing the technological era we live in. Barminski has a more dynamic and humorous approach to conveying his message. He mocks consumerism with his witty and blunt slogans and replications of consumer products. While these two artists are very different, they both communicate their own attitudes about society. Making a political statement through your paintings forces an audience to engage. Ultimately we want our art to be remembered and admired and I think if the message of a painting is clear then the viewer is more likely to go away and think about it. Paintings are a powerful tool to communicate a meaning that is deeper than the 2mm of paint on a canvas. Paintings are an artist’s voice. Bibliography / References / Acknowledgements. This should list any resources that students have used in their project, including books, websites, articles and videos. It might also include sources of first-hand information, such as museums, galleries or websites, as well as acknowledgements, thanking the artist for their time. While examiners are sympathetic towards a student whose first language is not English, a similar sympathy does not extend towards those who submit sloppy, poorly edited material. Just as it is expected that a Coursework project should contain beautiful well-composed artwork, a Personal Study is expected to contain well-structured, well-edited material. Even if a student has chosen to produce a largely visual project, submitting a sequence of annotated images, the text should communicate with intention and the writing quality should match that achieved by an A Level English student. Poor grammar, spelling errors and ‘txt’ speak are inexcusable. As with any important written project, drafts should be rewritten and refined several times: chapters re-arranged; paragraphs and annotation reorganised; repetitive material, waffle and unnecessary regurgitation eliminated. Teachers, parents and friends can all be recruited to read through drafts, highlighting spelling errors and identifying areas where the writing is muddled. While the work must of course remain entirely that of the student, feedback from a fresh set of eyes is invaluable. A Personal Study should include an appropriate range of Art related terms and vocabulary. While the exact words used will be dependent upon the nature and focus of the study, there are a number of general Art-specific terms which students should be familiar with (these will be listed, with their definitions, in an upcoming article). Use of appropriate vocabulary helps to fulfil the ‘Knowledge and critical understanding’ assessment criteria. As the title indicates, a Personal Study must communicate distinctly personal opinions, insights, judgements and responses, demonstrating a clear engagement with the artwork studied. I first encountered Sarah Lucas whist briskly strolling through the crowded rooms of the Tate. Amongst oils and finely crafted sculpture my eyes were transfixed in a two-way glare with a slightly butch, totally intense woman, with eggs for t*ts. Ever since then I’ve been hooked. It is evident that Yantra not only visited and viewed artwork in the flesh, but had a strong personal reaction to it. It could never be assumed that this segment had been reworded from a textbook: it is absolutely the words of a passionate high school Art student. Although Yantra uses coarse language within her study (something which should be emulated with caution) this project is an exceptional example of an intelligent and personal response to a topic. (More of Yantra’s work, as well as the entire text of her study, can be read in full on the great Julia Stubbs’ website). 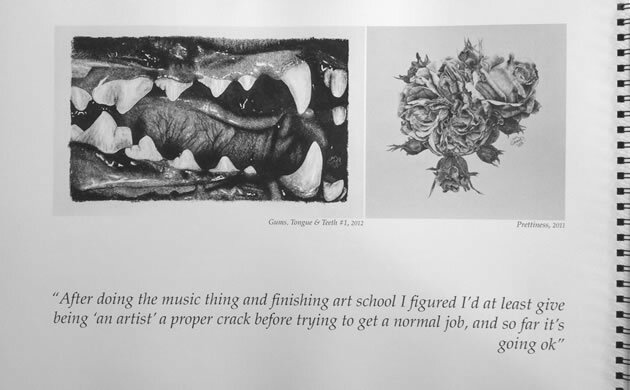 Similarly, this quote from an 88% OCR A2 Art Personal Study (one of the examples given in the OCR A2 Art Exemplar Work – Personal Study document) shows a personal response integrated within the analysis of Damien Hurst’s work, illustrated below. The musings about the tank breaking and the formaldehyde differing from expectations are clearly the individual thoughts of a high school art student. Within the Personal Study, students must demonstrate an understanding of cultural context – an understanding that an artist does not create work in isolation, but rather creates work that is shaped and influenced by the circumstance/s they finds themselves in. This might mean that discussion of the influence of natural, social, political or cultural environments is appropriate, or that – as is more common – the influence of other artists is discussed, with comparisons made between artwork that has been created in similar or differing contexts. 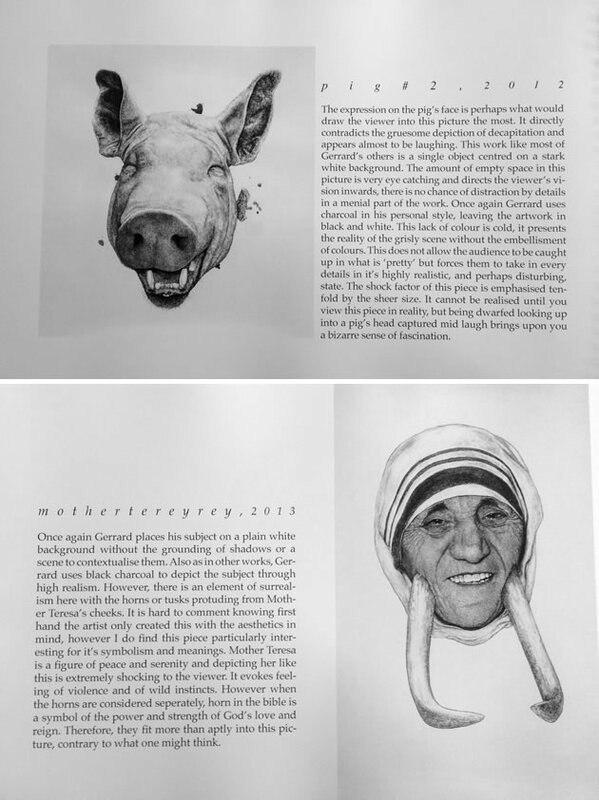 The excerpt below is from a CIE A Level Art and Design Personal Study by Tirion Jenkins, of YMCA of Hong Kong Christian College. 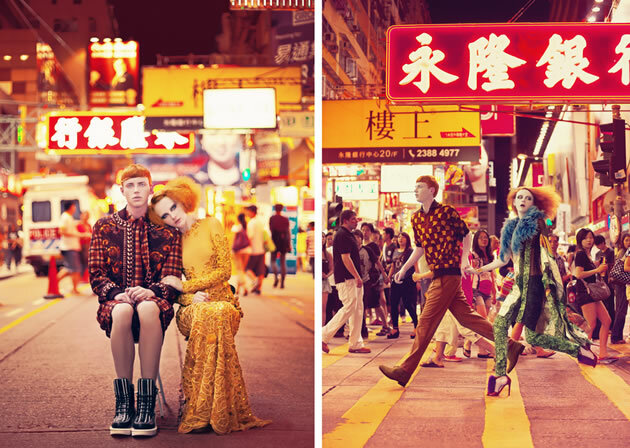 Titled ‘Alternative Fashion Photography’, her Personal Study was awarded Best in Hong Kong (2012) and includes analysis of ‘One night in Mong Kok’ by photographer Akif Hakan Celebi. Tirion demonstrates a clear understanding of the interrelationship between a photographer’s work and the setting in which it was created. The setting itself creates an intoxicating atmosphere with the rows of fluorescent light bulbs and layers of luminous signs that form an endless maze of gaudy colours. However, the setting does not overwhelm the two models who draw my eyes despite the signs above them. They create the focal point of the image through the use of the rule of thirds as they are placed off-centre and through their quirky appearance which magnetises the eye towards them. They seem to belong to a different world to the passersby behind them with their flare of red hair and audacious choice of feathered flittered clothes. Akif has further crafted the image through the use of makeup as their chalk white faces further segregates and emphasises their surreal doll-like appearances. …Akif’s pictures are reminiscent of Japanese cinema which he says he is so influenced by. “I like…its writhed and crazy stories; I feel very close to that way of looking at the world.” This photograph is particularly mystical due to the vibrant and decorative bokeh of Hong Kong’s street lights in the background. The core of the A2 Art Personal Study is the in-depth analysis of selected artist works. Some of these artworks must be viewed in person, however it is common (and completely acceptable) for students to analyse work from a combination of primary and secondary sources. In the best studies, artworks are chosen specifically to facilitate the discussion of issues which are relevant to the study. The advice in this section is particularly important and should be read closely by students who are hoping to achieve a high grade for their Personal Study. Composition is the placement or organisation of visual elements within an artwork – the way these have been composed, combined or ‘put together’. Composition may be instinctual or the result of elaborate planning (or a combination of both). A ‘compositional device’ is an aspect of a composition which has a certain effect (such as the use of frames within frames, which might help create a sense of distance or space within an artwork). Format is the overall shape, size and orientation (portrait or landscape) of an artwork, i.e. whether a work is painted on a long, horizontal oblong canvas, or upon a vertically orientated A4 portrait board. Format can be influenced by practical considerations (i.e. the nature and shape of the object or scene depicted) as well as being an active decision by the artist to help communicate a particular meaning or idea. The structure of an artwork is the organisation of basic forms within a composition (this will be illustrated in more detail in the subsequent post focusing on imagery). Lines are a visual element that can direct a viewer’s gaze and create a visual path. These can direct attention to a focal point and create depth through perspective or horizon lines. Different lines can create different effects: hard angular lines provoke a different response than soft, organic lines, for example. Repetition of lines can create a sense of movement or rhythm. Shape is a visual element that is created by the junction of lines or changes in tone: the perceived boundaries of form. Larger shapes can become dominant focal points within an artwork; similar shapes can be repeated to create balance and create unity / visual harmony. Shapes can be symbolic, i.e. they can represent more complex forms and carry meaning. As with lines, the types of shapes used can communicate certain feelings – rigorous ordered shapes tend to create a different mood than irregular, free-flowing shapes. Shapes might also be used to create borders / frames and boundaries that connect, overlap or intersect, perhaps helping to draw viewers from the foreground / middle-ground to background. Space – the absence of form – is an often overlooked visual element. Described as being either positive (the space contained within the boundary of an object) or negative (the background space in and around an object), space can determine how busy and cluttered a painting is. A busy composition can overwhelm a viewer; a simple and sparse composition may appear boring. Careful integration of space is fundamental to any artwork. Form is a visual element that is usually discussed more easily in relation to three dimensional objects (as three-dimensional forms are usually described within two dimensional works in terms of shape, tone and line). Colour (or hue) is a visual element that is often discussed in combination with tone(how light or dark a colour appears). Colour can affect the mood of an artwork due to colour associations – i.e. blue might indicate sadness. Tone can help to communicate a sense of distance (items that are further away generally appear lighter – due to ‘atmospheric perspective’). Both tone and colour can be used to create contrast within an artwork, attracting the viewer’s attention and helping to create focal areas. Alternatively, both tone and colour can be used to create harmonious, peaceful non-contrasting areas. Use of light and shadow or warm and cool might also be an important area to discuss. Texture can be real (the result of brush strokes, irregularities in materials, and the application of a range of materials) or implied…i.e. a surface that is made to looktextured. As with the other visual elements, texture should be integrated so that it balances and becomes an aesthetically pleasing addition to an artwork. Surface qualities – along with other detailed areas and intricate patterns – are only able to be appreciated fully when viewed in person. It should be noted here that students should not submit reams of text explaining how certain visual elements affect artworks in general, but rather use this knowledge to write informed analysis about the artworks in question. Here is another example by Nikau Hindin, discussing the use of line in paintings by Kelcy Taratoa. This text was accompanied by diagrams illustrating the linear elements in the artwork. …Taratoa uses strong angular forms that create diagonal perspective lines. These lines are called ‘leading lines’ and direct us to the focal point of this painting, which is a portrait of Taratoa. They also lead our eyes past him and make us look at the background. This helps to convey Taratoa’s message that one’s identity is linked to social circumstance, upbringing (background) and popular culture. Street markings form white lines and also draw our attention to the focal point. Street markings represent paths and therefore they may be paths to finding and constructing ones identity. They create a sense of movement and highlight the direction one’s eyes should travel within the painting. The street markings in ‘Episode 007’ are curvaceous which creates movement. The curvy lines mirror the organic forms of the superhero’s muscular body, creating a visual link. In ‘Episode 0010’ the repetition of line of the zebra crossing creates a sense of rhythm and leads us to the portrait of Taratoa in the left corner. Horizontal lines are repeated in the background of the painting to unite separate parts of the painting. As well as the aesthetic qualities discussed above, most students also include sections where they analyse artwork in terms of materials, processes, stylistic influences, techniques (use of media). For some, this is the primary focus of the Personal Study. This might include analysis of the way an artist has applied paint to a canvas (mark-making, brush strokes), the sequence of building up layers of paint over a prepared ground, or the sequence of events involved in creating a graphic design: from conceptual sketches, development of ideas, construction in Photoshop, through to proofing, paper selection and final printing. It might involve discussion about the way a composition is planned and designed and then the various processes that are undertaken in its completion. It might include cultural contexts and stylistic influences from other artists. In any sections of the Personal Study which are dedicated to process and technique, it is important to note (as mentioned above) that the examiners do not want the regurgitation of long, technical processes, but rather would like to see personal observations about how processes effect and influence the artwork that has been created. In all analysis of artwork, whether this involves discussion of composition, aesthetic qualities, cultural contexts, use of media, or approach to a theme, it is important that students move beyond simple observations and add perceptive, personal insight. For example, if a student notices that colour has been used to create strong contrast in certain areas of an artwork, they might follow this with a detailed and thoughtful assumption about why this is the case: for example, perhaps the contrast was created deliberately to draw attention to a focal point in the artwork, helping the artist to help convey thematic ideas. These personal insights could be backed up by earlier research, confirmed or suggested by the artist, or might be educated assumptions made by the student, based upon their own responses and personal interaction with the artwork. ‘Analysis of artwork’ does not mean ‘description of artwork’. Analysis means taking an artwork apart (thinking about it in terms of individual elements, such as line, or colour or technique), analysing these individually and/or in terms of how they relate to one another, and making personal observations and judgements, connecting this to the theme or focus of the assignment. Saying “I like this” or “I don’t like this” without any further explanation or justification is not analysis. Writing should be carefully integrated with the images, so that it is clear which text relates to which images (this will be discussed more in the subsequent post). In most works (the exception usually applies to those done in commission) the focus of the piece is centred, surrounded by empty space and never grounded through shadow or the like. This is another way in which Gerrard plays with commonly held opinions. Typically, a most aesthetically pleasing composition will follow the rule of thirds – a well known ‘rule’ that correlates to the focus of artworks being offset within the composition, and the entire image being visually divided into 3 sections. Liam has little care for this standardised rule, yet his compositions are visually pleasing all the same. I believe this could be because of the negative space, there is no overcrowding and it allows the viewer to focus on the subject. I also think this space is played upon in the display of the artwork. Galleries in general will have white or very light coloured walls so as not to distract from what is on display. By placing these white canvases on the white walls, hung without obvious framing, the artwork is allowed to ‘flow’ into the viewer’s world, there is no line of separation. This forces the viewer to study Gerrard’s pieces, and perhaps consider the personal message they address for the viewer in everyday life. The expression on the pig’s face is perhaps what would draw the viewer into this picture the most. It directly contradicts the gruesome depiction of decapitation and appears almost to be laughing. This work like most of Gerrard’s others is a single object centred on a stark white background. The amount of empty space in this picture is very eye catching and directs the viewer’s vision inwards, there is no chance of distraction by details in a menial part of the work. Once again Gerrard uses charcoal in his personal style, leaving the artwork in black and white. This lack of colour is cold, it presents the reality of the grisly scene without the embellishment of colours. This does not allow the audience to be caught up in what is ‘pretty’ but forces them to take in every details in it’s highly realistic, and perhaps disturbing, state. The shock factor of this piece is emphasised ten- fold by the sheer size. It cannot be realised until you view this piece in reality, but being dwarfed looking up into a pig’s head captured mid laugh brings upon you a bizarre sense of fascination. As explained in the previous post about topic selection, it is no longer necessary that the Personal Study relate to a student’s Coursework project. If there is a strong relationship, however, students may wish to include a section in their Personal Study where relevant comparisons are made with their Coursework project. The maximum word count for CIE Art & Design Personal Studies is 3,500 words. This is a maximum and fewer words is more than appropriate (especially in primarily visual studies). If a student is slightly over the word count, this is unlikely to be an issue (it is rare that examiners would know your exact word count, as no-one is likely to count every word in a project from start to finish); however, if a student is significantly over the word limit, this is obvious and a problem, running the risk that the examiners will run out of time (or enthusiasm) to read your project in its entirety. Almost all cases of word count breaches come from students who have attempted to bulk up their study with unnecessary information from second-hand sources. If you are encroaching the word limit, you should immediately ensure that you have not included supplementary research material or unnecessary information summarised from textbooks. If you are still battling with the word count and inclusion of material from second-hand sources is not an issue, you should re-edit your project, eliminating waffle, and ensuring you communicate succinctly. I encourage teachers to locate and print the excerpts from Personal Studies that are included in the 9704 Standards booklet on the CIE Teachers’ password protected site, which can be downloaded as a PDF document from the A Level Art & Design page. This document is invaluable. Finally, we are actively looking for more examples of high achieving Personal Studies to share on the Student Art Guide. If you or someone you know someone who excelled in this Component, please read our submission guidelines for more information. If you found this information helpful, you may wish to read the previous article in this series: How to select a great A2 Art Personal Study Topic or our overview of the CIE A Level Art: Personal Study.